In June, when Ontario’s eastern wolves were renamed Algonquin wolves, their at-risk status deteriorated, changing from Special Concern to Threatened. As a Threatened species, they were automatically and immediately protected across Ontario. 3 months later, most of that protection was removed. Wolves and coyotes are now protected in 4 areas centred around provincial parks. The largest of these areas is around Algonquin Provincial Park, the Algonquin wolf’s stronghold. Killing has been banned there since 2001 and has been a conservation success. Eastern coyotes and Algonquin wolves can’t be told apart without a genetic test. To protect Algonquin wolves, coyotes must also be protected. 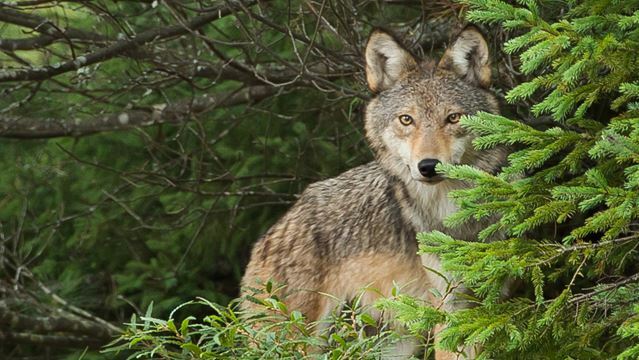 Instead of closing hunting and trapping of both species across the Algonquin wolf’s known range, Ontario announced that the new closures were being limited to 3 areas around parks where wolves have already been protected from hunting for years: Killarney Provincial Park, Queen Elizabeth II Wildlands and Kawartha Highlands Signature Site. The government has attempted to disguise these changes as an improvement of wolf protection – between the 3 new areas, 40 townships will be off-limits to wolf and coyote killing. 40 townships sounds like a big area, but in reality they make up a very small part of the at-risk wolves’ provincial range. The 3 new closure areas are far too small to recover the threatened population of Algonquin wolves. Wolves require protected corridors between areas of prime habitat. Only 1 of the new closure areas is connected to Algonquin Park. The other 2 are not islands of protection, but islands of extinction. 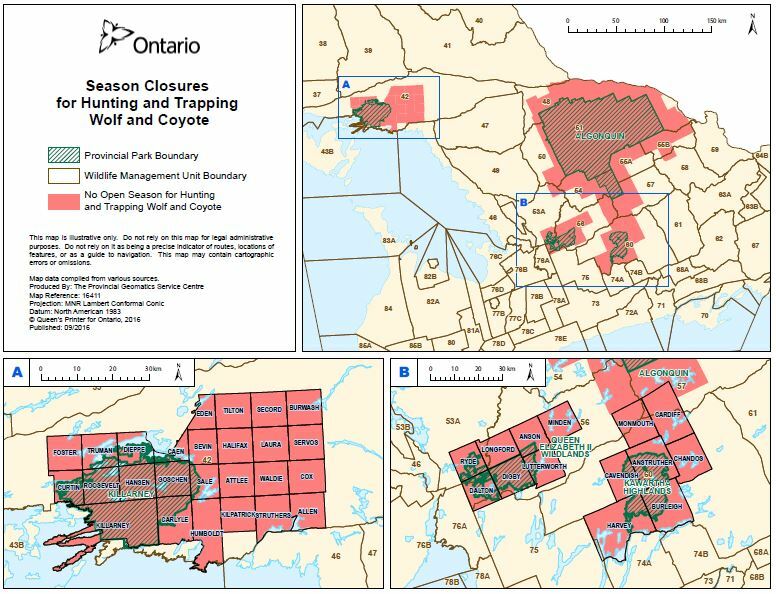 When added to the map showing the known distribution of Algonquin wolves, it is clear how small and disconnected the 3 new closures areas are. Compared to grey wolves, eastern coyotes or hybrids, Algonquin wolves have the lowest survival in unprotected areas. Wolves travel hundreds of kilometres in their lifetimes, and disperse from their birth pack to find a mate and open territory where they can raise their own families. 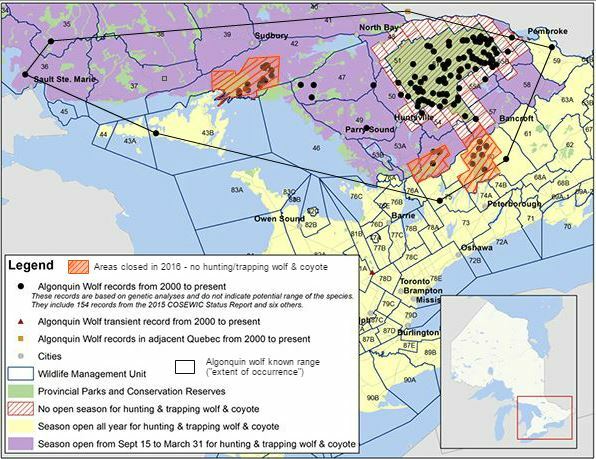 In Ontario, a Recovery Strategy will be due for the Algonquin wolf 2 years from their listing date, on June 15th 2018. The government has 9 months to develop a Response Statement that will outline actions that will be taken to protect and recover the species. We will continue to ask for increased protection based on scientific research about the effects of the 3 new closure areas on the population, and robust monitoring to determine exactly how many wolves are killed each year by hunters and trappers now exempt from the Endangered Species Act protection provisions. At the federal level, consultation is still underway to list them as a Threatened species across Canada. Thank you to those who submitted comments in support of this listing – together, we submitted over 2900 comments! 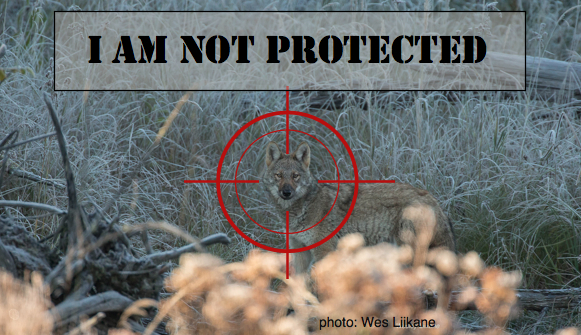 On July 22nd, the Ontario government proposed two plans that will hinder the recovery of this at-risk wolf population. On September 15th, After the shortest possible public consultation period brought in well over 15,000 comments, the provincial government announced that they are moving forward with their plans. This announcement was made on the very same day that hunting and trapping seasons open across the majority of the threatened wolves’ range. Hunting and trapping are the known primary threats to the Algonquin wolf. The 1st plan proposed was to limit new hunting and trapping bans, which are normally automatic for all threatened and endangered species in Ontario, to 3 small ‘island’-like closures around Queen Elizabeth II Wildlands and Killarney Provincial Parks and Kawartha Highlands Signature Site where hunting wolves has been banned for years. These closures are being peddled as imroved protection because most of the Algonquin wolf records (i.e. a single confirmed location for each Algonquin wolf) are included within these areas. However, the reason more Algonquin wolves have not been found elsewhere is because their survival is dangerously low where hunting and trapping occur outside of these parks. Moreover, a wolf is not a dot on a map. Wolves are capable of travelling hundreds of kilometres in their lifetimes, and almost always leave their birth packs to search for a new territory and a mate. Their inability to survive and reproduce in unprotected areas is the very reason why the wolves are rare enough to be deemed a Threatened species in the first place. It is appalling that this would be considered justification to continue ongoing killing where the wolves have been killed off before. The 2nd proposal contained a regulation change that would make the 1st proposal legal – an exemption for all licensed hunters and trappers from being penalized for killing an Algonquin wolf anywhere outside of the 3 new islands or existing protection in and around Algonquin Provincial Park, the species’ stronghold. Ontario claims their decisions are justified due to confusion on the part of hunters and trappers targeting coyotes. Indeed, without a genetic test, eastern coyotes and Algonquin wolves cannot be differentiated. The government has not announced plans to track the number of Algonquin wolves killed; without a genetic test even those hunters and trappers who do comply with mandatory reporting requirements cannot accurately determine which species they have killed. Hunters can kill up to 2 wolves annually if they purchase a game seal, the annual sales of which continue to increase since their inception in 2005. There is no limit on the number of wolves that can be trapped. The Ontario government also cites concern from livestock farmers as a justifiable reason to allow more killing of Algonquin wolves. However, allowing these animals to be killed does not prevent or solve livestock depredation – in fact, a growing body of research shows that hunting and trapping large carnivores can actually exacerbate the issue, increasing the number of livestock killed in future years. These regulation changes fail both the Algonquin wolves and the farming community. Hunting and trapping were banned in the townships surrounding Algonquin Provincial Park beginning in 2001 due to overwhelming public concern for the park wolves being killed as they followed deer to winter yards outside of the park. Subsequent research funded by the Ontario government found that 80% of Algonquin wolves that left this protected area were killed in legally set strangling snares or shot by hunters before being able to establish new packs in unprotected areas. Those wolves remaining inside the expanded protected area around the Park enjoyed several benefits – a stabilized population, a return to natural family-based pack structure and less need to hybridize with eastern coyotes. This year, public concern has been ignored – the majority of the 17,301 comments submitted in response to the proposals asked for more stringent protection under the Endangered Species Act. Scientists estimate that 65% of the world’s Algonquin wolf population inhabits Ontario, a mere 154 adult wolves. These wolves are now patchily distributed amongst a population of eastern coyotes and their hybrids. Eastern coyotes and Algonquin wolves are similar, but preliminary research results have begun to shine a light on how different their roles are within Ontario’s landscapes. Eastern coyotes, Algonquin wolves, and grey wolves eat different kinds of prey and thrive in different habitats. All three species are top predators, and all three play essential roles in our ecosystems. It is time we begin to value them for their inherent worth and the benefits they afford us, and stop trying (and failing) to eradicate, or ‘control’ them. A commitment to recovering socially intact Algonquin wolf populations requires protection of eastern coyotes as well. Wolves are a common feature of Ahousaht life, and I am so lucky to encounter them regularly along our shoreline. They are a special creature to meet and I feel blessed every time I encounter one. This year there was a litter of 4 pups born to one of the females in the pack. While they have not been seen in the village, they were seen on the mudflats of Sunshine Bay in the early mornings. Perhaps next year I will see some pups. WINNIPEG — A pair of wolves have been destroyed in the Victoria Beach area after killing at least three dogs. An official with Manitoba Conservation and Water Stewardship said they were unable to relocate the wolves because they likely would either have been driven out or killed by other wolves in the new location. The wolves were killed by a professional trapper that was hired by the province last month. Wolves have become increasingly territorial in the Victoria Beach area and pet owners have been warned to keep their dogs and cats indoors.